If you could divide the population into two categories, ”the doers” and the ”reading and writing about-ers”, I’ll definitely fall into the latter. When you love to read and learn new things, it is easy to end up in a state of information overload. At the moment I’m taking a course in research method, which is supposed to prepare me for my bachelor thesis. It is very academic. I also love to read novels, listen to interesting podcasts, follow debates or watch tv series, go to open lectures at evenings every now and then, and write. Phew. Sometimes there’s just no way I can stuff more information into my head. At that point I cook. I find it so relieving to put on the ”talking radio” in the background and just loose myself into hours of working with my hands, improvising, smelling, tasting, kneading, spicing and every once in a while catch an interesting comment from the ongoing radio show. The baking is a new thing, I think. I never really used to bake before, and I (almost) always fail when trying to make gluten-free bread or vegan cookies. However, this vegan and gluten-free bread turned out amazing already at the first attempt! It is not overly sweet, so I like to eat it with butter, a salty cheese and cucumber (ahh I know, so much for ”vegan” right…) or smeared with peanut butter. It is soft and moist from plant milk and olive oil and contains crunchy nuts, chewy raisins, gooey and half melted chunks of dark sea salt chocolate and is just sweet enough from bananas and coconut sugar. All natural ingredients with lots of good stuff. In other words it is super nourishing, and works just as great for breakfast as well as coffee cake. But let’s decide this is a breakfast bread, cause who does not like dessert for breakfast, right? Notes to this recipe: 1. My recipes are adapted to european size standards, hence the haphazard size indication when using cups. Sorry about that. 2. 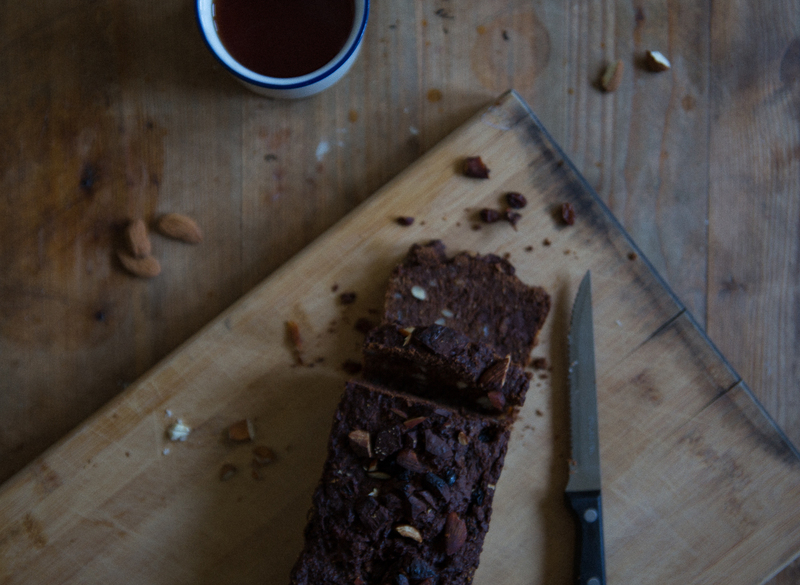 Yes I know there’s hazelnuts in the recipe and almonds in the photos! I’ve been making this recipe like a quadrillion times, and I don’t have time to take pictures of it every time : ) 3. For a strict vegan version, use dairy-free chocolate or substitute chocolate for an additional tbsp cacao + more coconut sugar. 4. Please don’t let the long list of ingredients frighten you! That’s the thing about baking gluten-free. You’ll need different kinds of flours with different qualities to complement each other. Set oven to 200’C. Combine water + chia seeds (”chia eggs”) in a cup or bowl. Stir thoroughly to avoid lumps. Set aside. In a food processor, mix rolled oats into a coarse flour. 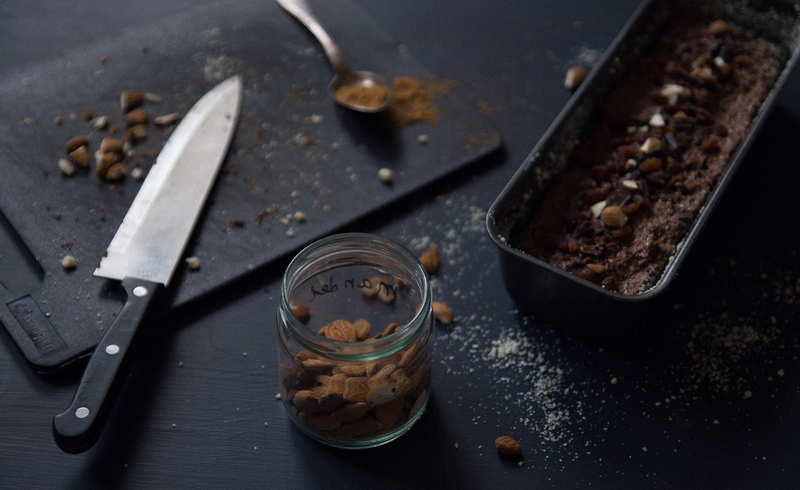 Coarsely chop nuts and chocolate. Transfer oat flour to a large bowl and combine with hazelnuts, chocolate and the rest of the dry ingredients. Set aside. In another large bowl, mix bananas, plant milk and olive oil using an immerson blender (hand-held), or mix in blender, until smooth. Stir in the chia eggs and whisk to loosen up all lumps. Add the dry mixture to the banana batter, little by little, while stirring. The batter/dough should be very sticky and sort of crumbly. It will feel like it’s too dry, but trust me, it’s perfect! Grease a 12 x 4,5 inch loaf pan with coconut or olive oil, and cover in almond flour. Press batter into the pan, eliminating all air pockets. Wet a spoon or spatula and even out the surface. 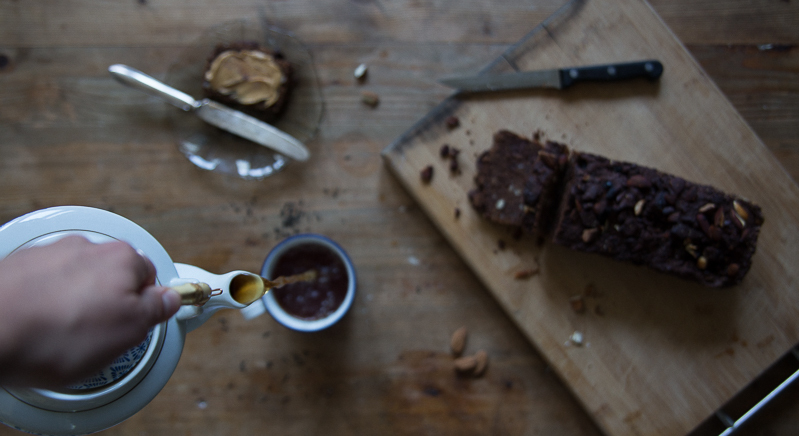 Garnish with nuts & seeds of choice (preferably hazelnuts) and 20 g of coarsely chopped chocolate. Bake in the middle of the oven for about 45-55 min depending on your oven. I use a crappy and unreliable gas oven so mine took a little over an hour (! ), bur seriously, don’t trust my oven. I also tried the recipe in a regular, but old, oven which took about 45 min. If you’re oven is a high tech brand new one, keep a look out from 35 min and onwards. The bread is done when you can stick a knife into it without it getting greasy, and when the nuts on top are golden and bread surface cracked. The pictures are stunningly lovely – as per usual :). I think these are in fact my favourite so far. The recipe looks great too. Just perfect for this time of the year. Åh, det låter helt fantastiskt gott! Måste läggas till att-baka-listan. I look forward to take some time to clear my head, bake & try this recipe. Luckily my pantry is rather well stocked these days so I think I have most of the ingredients to hand. Now I just need time. Haha me too! So much for a varied diet right? Aou har väntat på det här receptet! Blir helgens frukostprojekt.